A medium-sized slender snake with a head not much wider than the cylindrical body with smooth shiny scales. The scale count at mid-body is usually 21 - 23..
Black, red, and white or yellowish rings circle the body. The red bands are wider than the black and white bands, but in many specimens all bands are near the same width. Some black bands may widen and cross over the red bands on the back. A red band surrounded by two black bands is referred to as a "triad." Typically, more than 60 percent of the triads have complete red bands with no black crossovers. On this subspecies there are 24 - 37 triads, with an average of 27. The bands continue across the belly, but the coloring is paler, more faded in appearance, and the bands are more irregular, often encroaching into adjacent bands. The snout is black. The rear edge of the first white band on the head is located behind the corner of the mouth. Secretive, but not rare in suitable habitat. Spends most of the time underground, under surface objects, or inside rock crevices. Occasionally seen active on the ground in the daytime, especially near shaded streams on hot sunny days. Active during the day at high altitudes during times of low nighttime temperatures (which is typical habitat.) When temperatures are more moderate, it can be crepuscular, nocturnal, and diurnal. During very hot weather, activity is primarily nocturnal. This snake is normally active at temperatures between aproximately 55 - 85 degrees. Enters into winter hibernation typically around November, emerging some time from February to April, depending on location and weather conditions. 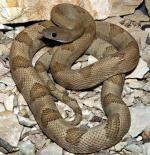 Eats lizards, small mammals, nestling birds, bird eggs, amphibians, and occasionally snakes, including its own species. Breeding takes place a few weeks after emergence in the spring. Eggs are laid June-July and hatch after 50 - 65 days. This subspecies, Lampropeltis zonata zonata - St. Helena Mountain Kingsnake, occurs from southern Napa and Sonoma Counties north along the north coast ranges to Trinity County where a large intergrade range with the Sierra Mountain Kingsnake - L. z. multicincta begins. There are unconfirmed reports from Marin County. 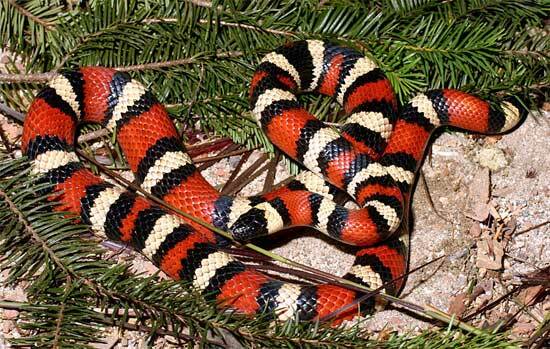 The species Lampropeltis zonata - California Mountain Kingsnake, occurs from northerm Baja California, to southern Washington. In California it is found in the San Gabriel, San Bernardino, San jacinto, Santa Monica, and Santa Ana mountains of southern California, and throughout the Sierra Nevada mountains into the Tehachapi mountains. It ranges along the south-central coast and through the south coast ranges and part of the Diablo Range, continuing north away from the coast along the north coast ranges into the mountain ranges in the far north of the state. There are unconfirmed sight records from the White Mountains, Mt. Diablo, the interior south coast ranges, Santa Catalina Island, and Marin County. "Examination of colour pattern variation in 321 living and preserved specimens indicated that the two main colour pattern characters used to define the subspecies are so variable that they cannot be reliably used to differentiate taxonomic units within this complex, which calls into question the recognition of 7 geographical races of this snake." Mitochondrial DNA studies found 2 clades of L. zonata, a southern clade from Baja California and southern California, and a northern clade comprised of two subclades - a coastal subclade from the central coast and southern Sierra Nevada Mountains, and a northerneastern subclade of populations north of the San Francisco Bay and most of the Sierra Nevada. Reptile hunters are usually blamed for rock habitat destruction, but bulldozers are far more destructive. I have also witnessed people tearing off huge slabs of granite with a crowbar then carrying the slabs back to their truck to haul them away.